The Thule Urban Glide impressed us at the Harrogate Nursery Fair with its large seat, great headroom, and easy push. We also loved the large covered storage bag and adjustable handlebar. So we had to try one out! When the Urban Glide arrived, we couldn’t wait to get out and use it; and it didn’t disappoint. We have had the Thule Urban Glide for 18 months now, and we love it! 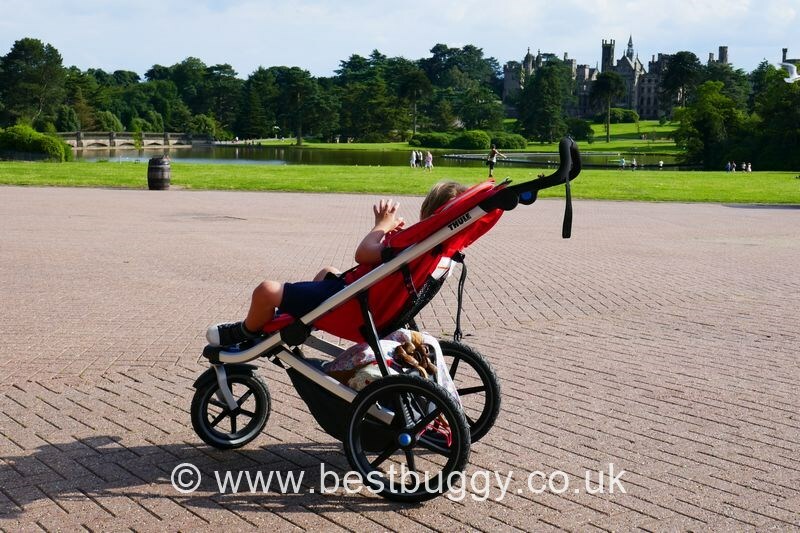 It is by far the lightest and smoothest pushchair we have ever used and we wish we had discovered it years ago! The Urban Glide seat is huge with excellent leg room. The seat is well padded with an equally well padded calf rest. This is good to note because this is an all terrain pushchair and so all round child comfort is vital. There is a generous hood with plenty of room for an older child’s head. At time of writing, Master BB is 7 and 120cms tall, and he can fit comfortably under the hood rim. The maximum child weight is also a huge 34kg! That’s the weight of Little Miss BB who is 9 years old. Our only negative of this pushchair is that the seat depth is a little shallow for such a large weight capacity child. 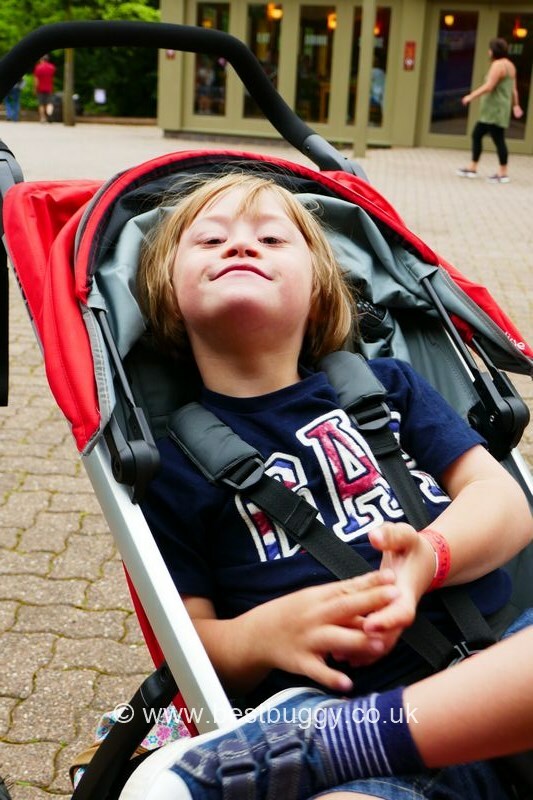 Admittedly Master BB is out of the normal age range for using a pushchair……however parents who run, tend to push their children along with them until a higher age. I have no doubt that Master BB was comfortable, he just always seemed a little ‘perched’ aged 6. However, with excellent leg room, and a good supportive foot rest, it wasn’t really an issue. 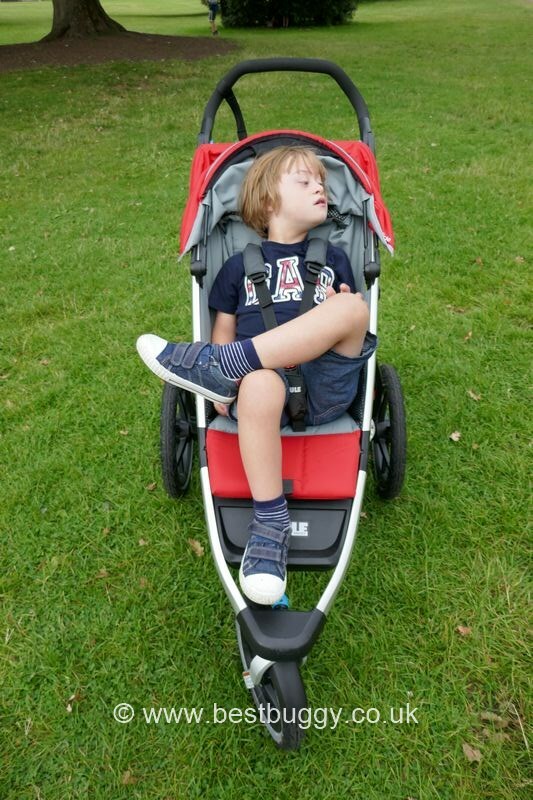 There is a strap recline at the rear of the seat for a sleeping little one, however there is no lift up calf rest to support little legs, although there is plenty of padding below the seat edge for legs to rest on. With the seat reclined there is a cover which can be lifted to reveal a mesh panel to provide ventilation whilst your little one sleeps. The 5 point harness is excellent with thick crotch and shoulder harness pads. These haven’t fallen off which is a real positive! The harness buckle is a little tricky to undo because you need to hold one or both of the top red buttons together, before releasing one or two of the side black buttons (one side can be done at a time), but it certainly makes it child proof! There is a large hood on the Urban Glide. At the front there is a flick out sun visor which has mesh to help shield your little ones eyes. On top there is a covered peek-a-boo window with a neat magnetic closures. The hood can be opened at the rear, and then the hood moved forwards to follow the sun to create maximum shade. The hood itself is quite stiff to move as it is framed. On each side of the seat there is a mesh pocket for drinks or small toys. These are handy for your child if you are on a long run. There is a large mesh pocket on the rear of the seat which is handy for keys, maps and drinks. Underneath the pushchair is a very large storage bag. We say bag rather than basket because its solid canvas type fabric with a solid canvas cover. The cover zips on down each side and then velcros together at the rear. The basket isn’t easy to access simply because you have to undo the velcro and zips, but this is a pushchair designed for going off road, and it will keep everything contained inside when bumping along tracks. The water resistant fabric will also help keep the contents dry in wet weather. There is also a zipped compartment at the very rear of the bag to keep phones etc. to hand. The raincover is an optional accessory for the Urban Glide. It costs £35. It is quite usual to have to pay for a raincover for an all terrain pushchair. The ergonomic design and the perfect handle girth combined with lovely squishy foam makes for a enjoyable user experience. 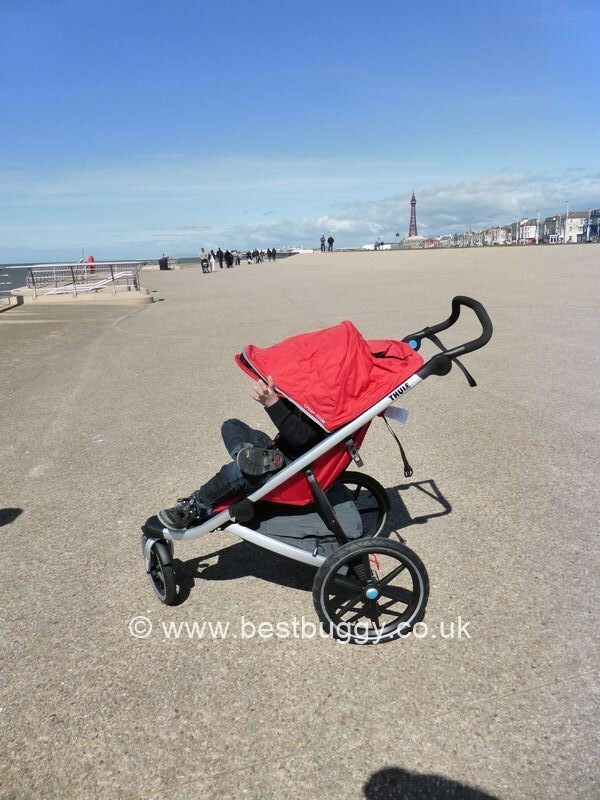 Combine that with a lightweight 10.5kg chassis, which gives an amazing light push, and you get one of the best pushchairs we have ever used. The Thule Urban Glide is so unbelievably smooth and easy to steer even one handed and with a big child on board. The two huge rear air tyres, and the fantastic rear suspension absorb every bump or lump in the road. Even with 7 year old Master BB in the seat, the Urban Glide is effortless to push. Kerbs were no issue, cobbles were simple. 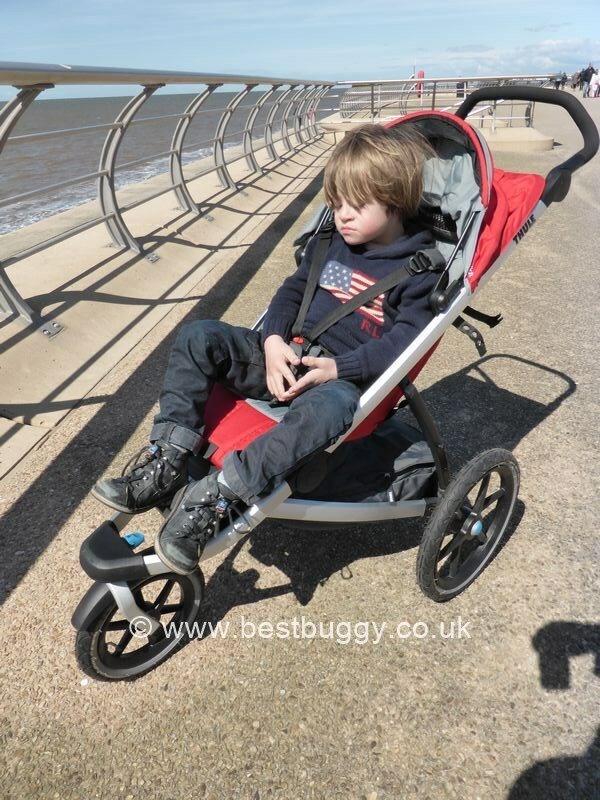 This really is one of the most beautiful pushchairs we have ever pushed…..an utter pleasure! The handlebar itself can be adjusted by releasing round buttons on either side of the handlebar and then rotating it up or down. Relatively speaking the Urban Glide is a tall pushchair, and one we recommend you try out if of shorter stature. Thule do advertise the Urban Glide as suitable for jogging with, and the front swivel wheel can be easily locked into a forwards position using a blue twist button above the front wheel. There is also tracking on the front wheel which is adjusted via a dial. However we would suggest that if you are a serious runner that you consider the Glide pushchair with its handbrake and fixed front wheel. 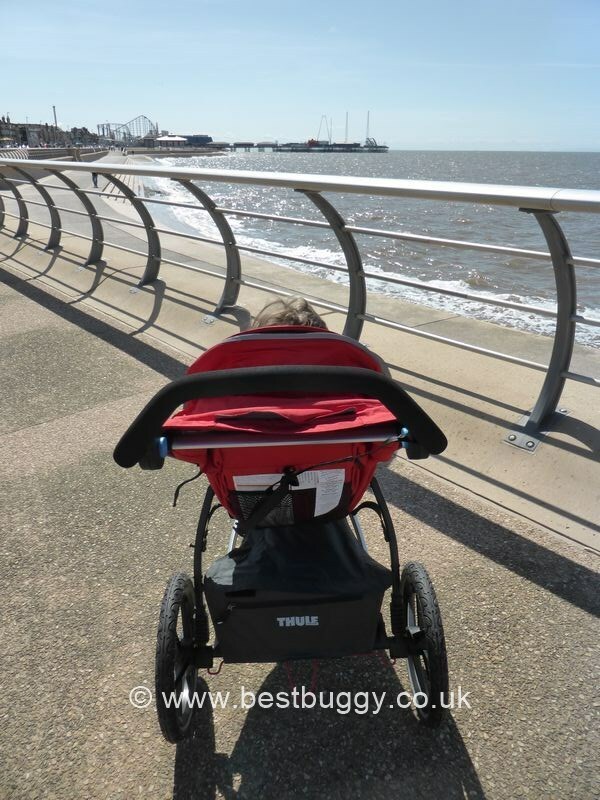 This pushchair, the Urban Glide is better for the jogger who needs a practical about town pushchair too as it will easily adapt to live in the City or heading out for a run across all terrain. The huge rear air tyres are one of the most notable features of the Urban Glide. These may people off buying this pushchair, and the large circumference also makes the Urban Glide into a tall pushchair. However, do not be afraid, because this pushchair will push itself and the wheels simply pop off when you need to store the chassis. Simply press in the centre of the hub, and the wheels come off. Adding slime in the wheels will prevent any punctures. 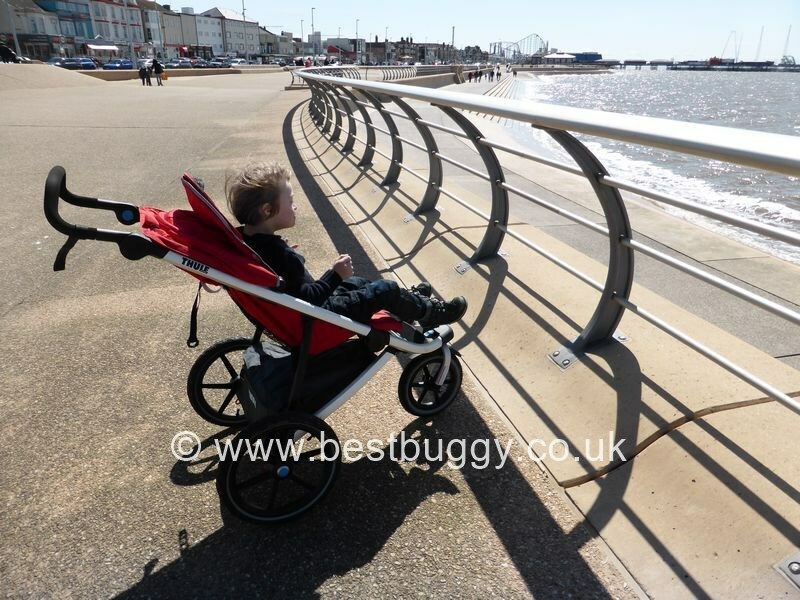 The Urban Glide is only 53cm wide which is quite narrow for an all terrain pushchair. There is a wire footbrake on the Urban Glide which is quite hard to engage. You need some decent shoes on! Just a note here to say that there is a double version of this pushchair called the Urban Glide 2. To be honest, if we were starting again looking for a double side by side buggy, the Thule Urban Glide 2 would definitely be one that we would want to try out. We suspect it would be very light to push with two on board, as well as being one of the lightest doubles to lift. The Urban Glide can accommodate a Thule bassinet or a car seat. The compatible car seats include the Maxi-Cosi Cabriofix, Pebble and the Nuna Pipa. However, the car seat adpator must not be used with a child weighing above 10kg which is important to note. Also please note that it is not advisable to run or jog with a baby under 6 month’s of age. However, the carrycot and travel system option mean you can use this pushchair from birth. The Urban Glide fold really was a good selling point for us. The pictures of the fold make it seem quite a chunky fold, but we found that with the rear wheels popped off (very simple to do) the fold was very flat, although quite long. But this made it easy to stand the Glide on its side either at the back or the very front of the boot. It was actually a useful shape for us unlike a pushchair which folds in a block shape. With the wheels off the chassis was even lighter to lift, and it was no problem for me (with a back problem) to put the frame in and out of the car, and move it around in the boot. The fold mechanism itself is quite unusual. The calf rest flap lifts up using a small tab to reveal a large blue barrel. This has clear instructions on it to slide the barrel left, and then rotate it around towards the rear of the pushchair. This allows the Glide to easily fold using just one hand with a baby tucked under your arm. The pushchair can easily be lifted up and carried by this handle, or it can be be towed along behind you, directly after being folded. The wheels come off very easily and can be stacked neatly on top of the folded chassis. We like that the Urban Glide can freestand easily when folded. It has made it easy to store. There is a fold lock – a rubber loop with three holes in. This is rudimentary but does work. To be honest, the Glides holds together well without using it, but it is there if you require it. Thule have an amazing 10 year warranty on the frame (2 years on the fabrics) which should give confidence in the build quality and strength of this gorgeous but practical pushchair. 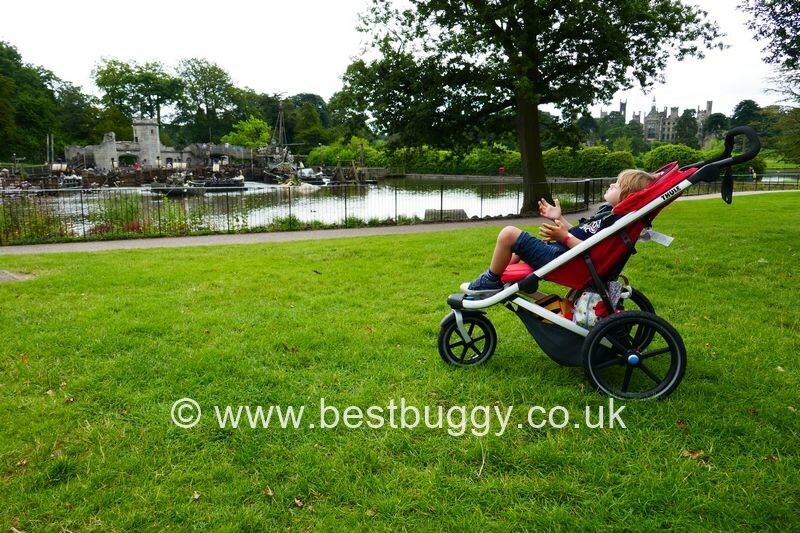 The Urban Glide seems to take all the best parts of the other leading all terrain pushchairs from Baby Jogger, Mountain Buggy, TFK, BOB and Out ‘n’ About; and has rolled them all into one superb pushchair. Any Nipper fans will love this pushchair! The Urban Glide has become one of our all time favourite pushchairs because it is incredibly light to push, but also light to lift and carry. The seat is a very generous size although we would have liked to see the seat a little deeper. The storage is excellent and is well designed for the off road lifestyle, with thought given to the child inside. We have no doubt that any child will be comfortable in the seat with its excellent padding, especially for little legs, although a lift up calf rest would have been the icing on the cake. 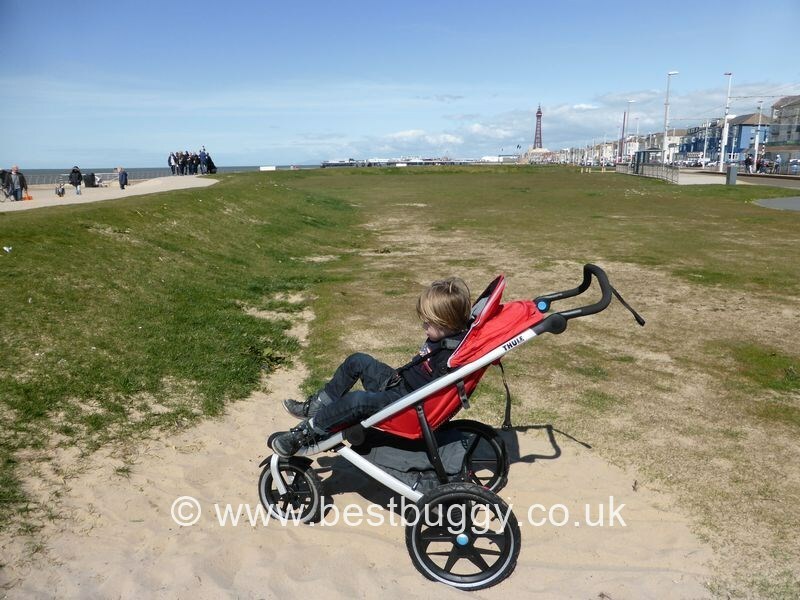 The Urban Glide ticks all the boxes for us for a great all terrain pushchair, as well as a fantastic do everything, all rounder. 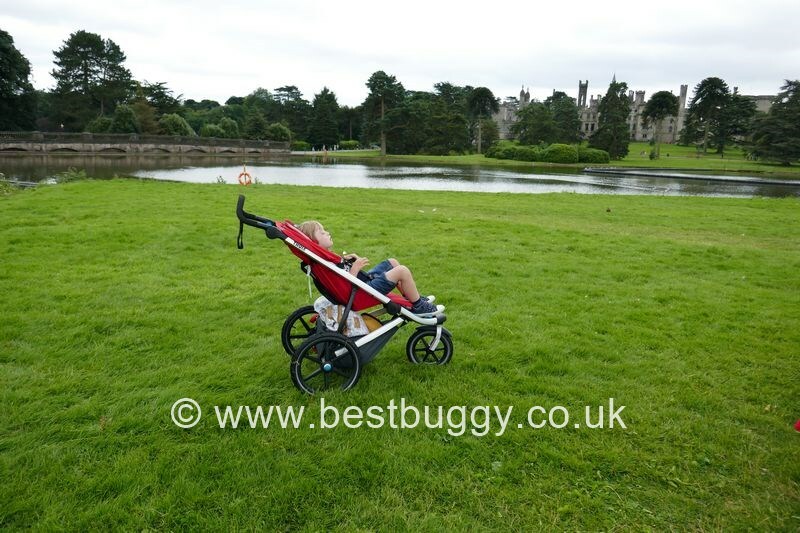 It is probably our all time favourite all terrain pushchair and for that reason, we are giving it a well deserved Best Buggy 5 gold star rating!